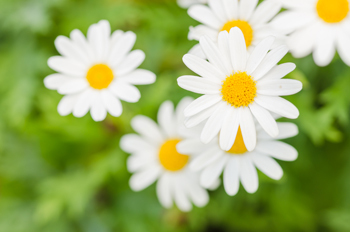 The April birth flower is the daisy. The daisy conveys innocence, loyal love, and purity. (remember the popular childhood saying ‘he loves me, he loves me not’?) It is also a flower given between friends to keep a secret; the daisy means “I’ll never tell.” It is also said to represent fertility and motherhood – the reason why it is commonly gifted to new mothers. Symbolic of wealth, prosperity and fortune. It is also the flower of friendship. Symbolic of splendid beauty. It is also used to indicate worth beyond beauty. Symbolizes hospitality. It is also used to indicate happiness and abundance. Symbolizes patience. It is also indicative of a love of variety. It also symbolizes elegance and daintiness. Symbolizes good luck - sure to bring the recipient good fortune! Symbolic of joyfulness. It also symbolizes magnificence. It can also be used to indicate exciting and wonderful anticipation. Symbolic of honesty & truth. Conveys innocence, loyal love, and purity. It's also said to represent keeping a secret between friends. Symbolizes big-heartedness, fun, lightness and levity. Symbolizes purity and sweetness. They indicate secret love. Symbolizes strength of character, faithfulness and honor. Often used to express a thank you for understanding and other deeper, heartfelt emotions. Symbolic of love, beauty, refinement and wisdom. Symbolic of a thoughtfulness, remembrance and togetherness. Symbolic of your desire to spend time with someone because you find their company soothing and peaceful. Symbolic of love. Special colors are symbolic as well: Coral: desire Lavender: love at first sight Pink: thank you, admiration, gentleness, grace, gladness, joy and sweetness Red: love, respect, courage, passion White: purity, secrecy, silence innocence and charm Yellow: joy, gladness, friendship and "I Care"
Symbolic of remembrance. It also symbolizes sympathy and success. Symbolic of pure thoughts, adoration & dedication. Signify a declaration of love. Meanings including thoughts of friends, endurance, daily remembrance, goodness and lasting affection.